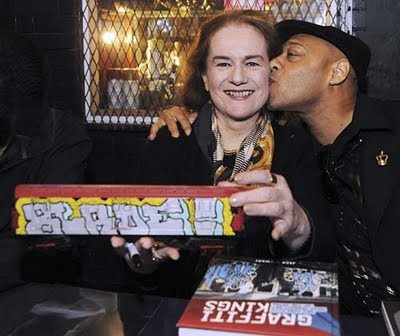 Tina sent me a link from "New Yorker" magazine about the "Graffiti Kings" book launch held at Alphabeta graffiti store in Brooklyn. It is said that "Graffiti Kings" was a graffiti world legend before its official release. It was "rumored to exist, seldom seen, a near-equivalent to the Dead Sea Scrolls." Curiously, the original dissertation book containing ~400 original and rare images of graffiti trains popped up for sale on eBay last year, but was quickly returned to the rightful Jack Stewart! Now in 2009, Abrahms is publishing "Graffiti Kings" which is acknowledged as the only graffiti bible BEFORE Chalfant and Cooper’s "Subway Art" book (which captured the prolific 1980-83 period.) Stewart was a painter and art historian, who was there when graffiti made its way from the streets to the moving gallery of subway trains in the 70s. It was this cultural phenomenon that Stewart documented for his doctoral thesis through interviews and photographs. 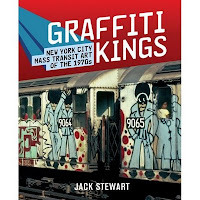 Sadly he passed away before the book was published, but his widow, Regina, edited Stewart's dissertation and got "Graffiti Kings" published. This picture shows a model subway car that Blade painted with his name on one side and Regina’s on the other. Now we all have a chance to treasure this graffiti history tome that contains archival photographs of the classic bubble-letter and 3-D pieces to the whole-train pieces along with other information that provides a real glimpse inside the world of a graffiti artist when he was still regarded a vandal and *way* before he was accepted into the downtown gallery scene! Subway Art - It's come a long way...graffiti art!